Food Sovereignty Ghana (FSG) wishes to thank the Parliamentary Appointments Committee for raising our objections to the nomination of Hon. 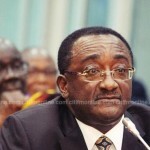 Dr. Owusu Afriyie Akoto as Minister-Designate for Food and Agriculture. However, we cannot hide our complete disappointment in the manner the question was framed which was a complete neglect of the actual basis of our specific objections to the nomination. It appears that the entire import of our objection was either lost on the Appointments Committee, or deliberately ignored. We therefore wish to restate our case clinically and in plain language, and leave it for the Ghanaian public to judge for themselves. In a nutshell, our case is that there is no consensus on the safety of GMOs in the scientific community. This position is actually the title of a peer-reviewed article “No scientific consensus on GMO safety“, published in a reputable scientific journal, Environmental Science Europe, so it cannot get more scientific than that. FSG, and we believe, almost all Ghanaians are very clear that we have no intention to be treated like lab rats and will not brook any insults from our own elected representatives about it either. The basis of our objection to Dr. Afriyie Akoto’s nomination was captured on TV, where he attacked those citizens who, concerned about the infiltration of GM foods into our food chain, sometimes without labels, are therefore calling for strict precautionary measures in view of the lack of scientific consensus on its safety for humans, animals, birds, insects, and the natural environment. Dr Akoto did not only exhibit a very closed mind to a serious public concern, but arrogantly demanded our death before complaining! We believe this is completely unacceptable behaviour, absolutely unbecoming of a public official, as it portrays his contempt for both the public and for the office. We find the attitude adopted by the former Minority party’s Parliamentary spokesperson for Agriculture, to be far below the minimum standards required for any person to serve in public office. He did not only resort to name-calling such as “hypocrites”, but even worse, presented a strange and rather irresponsible pathology for determining the safety of GMOs, live on TV. There are better and more scientific ways of detecting the safety of GM foods than to wait until we are all dead! It is this particular judgement call that makes him unfit to be in charge of anything near our food! We believe that no self-respecting country can allow such an individual to be in charge of vital decisions where food is concerned. Obviously, whatever answer Dr. Afriyie Akoto gave to this question is completely irrelevant, as our question in our Memorandum was not put to him in the first place! Our Memorandum to the Chairman clearly stated our objection to Dr. Afriyie’s appointment, citing his irresponsible remarks as quoted above. We seek to concentrate on the substance of our objections and not play the game of mixing this with the Plant Breeders’ Bill. Hence our comments on the Plant Breeders’ Bill shall appear in a separate statement. Suffice it to say that at this point we consider the introduction of the Plant Breeders’ Bill into the whole affair of our objection to his appointment, as very ominous indeed. In the first place, we are horrified that not only was our question not asked, but also, they used the opportunity to digress from the real issue and deviate to the Plant Breeders’ Bill. As the latter was not even mentioned once in our Memorandum to the Appointments Committee, we can surmise that what we saw on display was an obviously calculated piece of mischief designed to carry forth their own agenda of doggedly imposing the UPOV-Compliant version of the Plant Breeders’ Bill on Ghanaians! Obviously, we are not satisfied at all. On the contrary, we were horrified to watch the chairman of the Appointments Committee also making similar trivial remarks of his own instead of addressing the issues we presented him with. Our question was not necessarily on GMOs but rather pointed out Dr Akoto’s apparent lack of a sense of responsibility in making inane statements with grave implications for our health, wealth and sovereignty, some of which we have quoted above. In a clear departure from the sort of composition a gentleman of his stature should assume he further displayed exactly the sort of behaviour we have cited earlier as insensitive to Ghanaians when he said on the floor of the Appointments Committee that “Mr Chairman I think your comment is very apt because you know something? GMO has been adopted and is actually the force behind American agriculture now”. “America produces GMO and the Americans are not dying of some funny cancers and so on so I don’t even know where this whole impression is coming from”. Strangely enough, he added, “That does not mean we should adopt GMO”. So, why should we ALL DIE first before he listens to us, especially as he himself now says we don’t even need it? We therefore call for a thorough review of the appointment of Dr. Owusu Afriyie Akoto as Minister-Designate for Food and Agriculture.